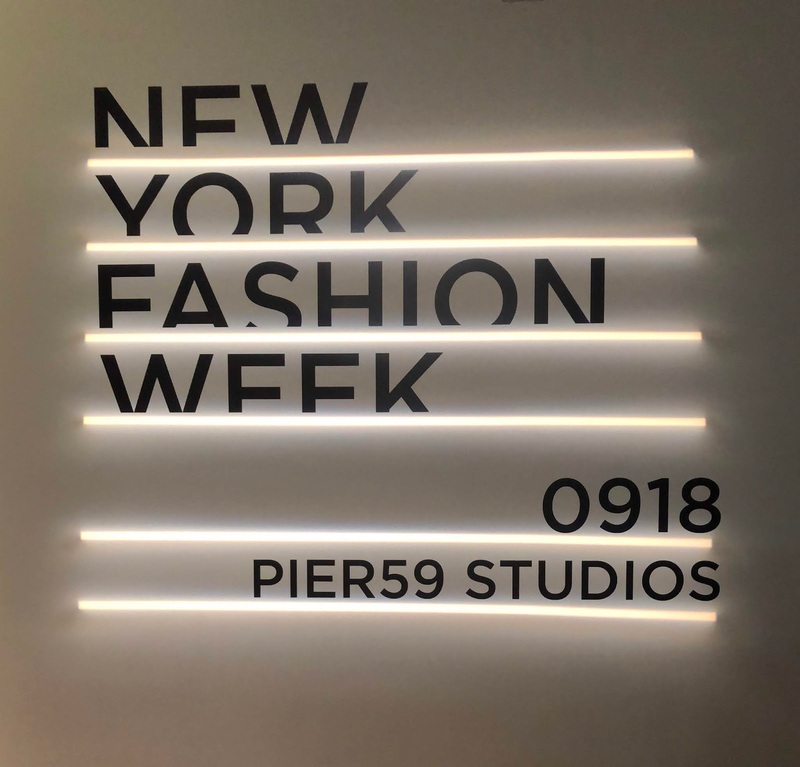 I know you guys have been waiting for my NYFW posts and I am so sorry for the delay. The week I got back from all of my festivities Hurricane Florence came into town and I went straight into preparation mode. Its taken some time to get back into my routine, but I am so happy and grateful that my family was not majorly affected by the hurricane and my prayers are with the coast of North Carolina and the families working to get back to their homes. I love going to New York to see fashion shows but it is not 100% all fun and games. NYFW is not NYFW without a little craziness, mixed with some frustration, and a few moments of inconvenience. My flight landed at JFK at 12. In order to make sure I was on time for my 3:00 show I decided to take a shuttle. That was my first mistake. The shuttle took almost an hour to pick me up and traffic was terrible. I should’ve opted to take the subway and just risk being sweaty and gross. On the other side of that our hotel was completely booked and it was looking like we would not be able to check into our room earlier. As a result, I ended up missing my first show which was Pamella Roland, I was heart broken. I absolutely loved her show last season (see my recap here) and I was really looking forward to her Spring/Summer 2019 collection. 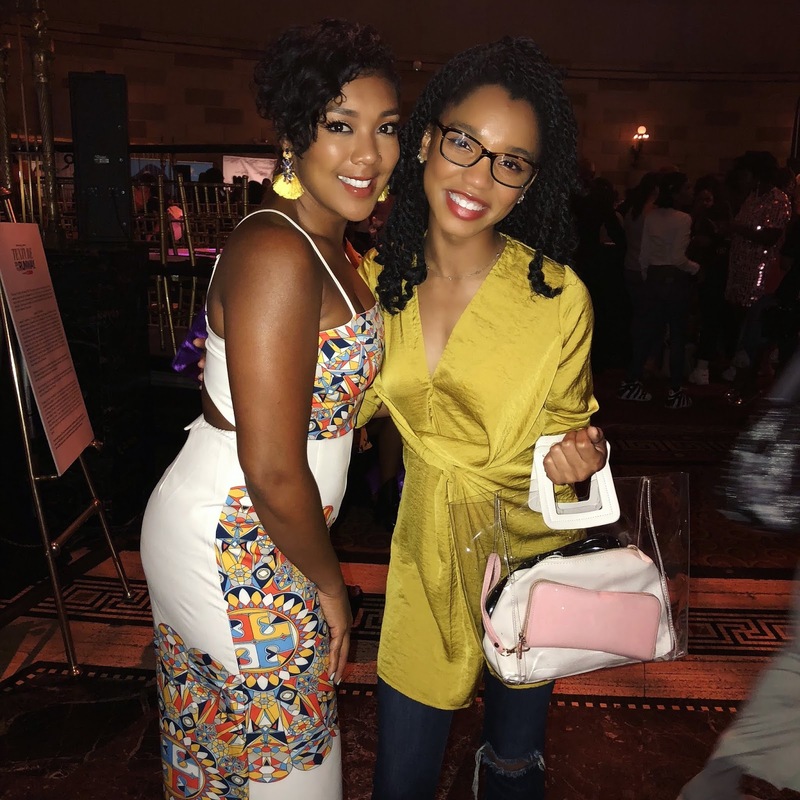 Since our plans got a little messed up for the day my cousin and I looked into a few other things we could check out while we waited for the NaturallyCurly, Texture on the Runway hair show to start. 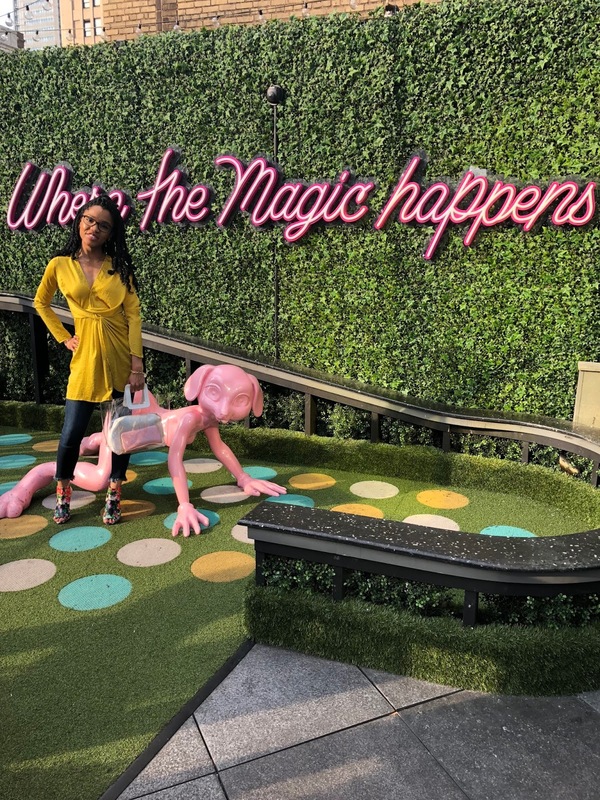 We ended up going to the new Moxy Hotel located in the Financial District. This hotel has an amazing vibe and is extremely successful with catering the hotel experience to millennials. With elements like arcade games and constant music, it seems like an amazing place to stay! We went to a funhouse exhibition that was going on at the time and took a few pictures on the rooftop before the show. Let's talk about my outfit really quick! I decided to try and outfit a little outside of my comfort zone. I purchased this gorgeous yellow dress from Boohoo last year for a homecoming event. It has a major slit that I decided to tape up so I wouldn’t have to worry about any wardrobe malfunctions. I am personally trying to do a better job about rewearing my clothes. I am just trying to walk away from the idea that I have to buy a new outfit every time a different event comes. I can switch it up, just like I switch up my work wardrobe. With that being said, when I was looking through my closet at items I already owned for inspiration I saw that dress and wondered how I could style it differently. 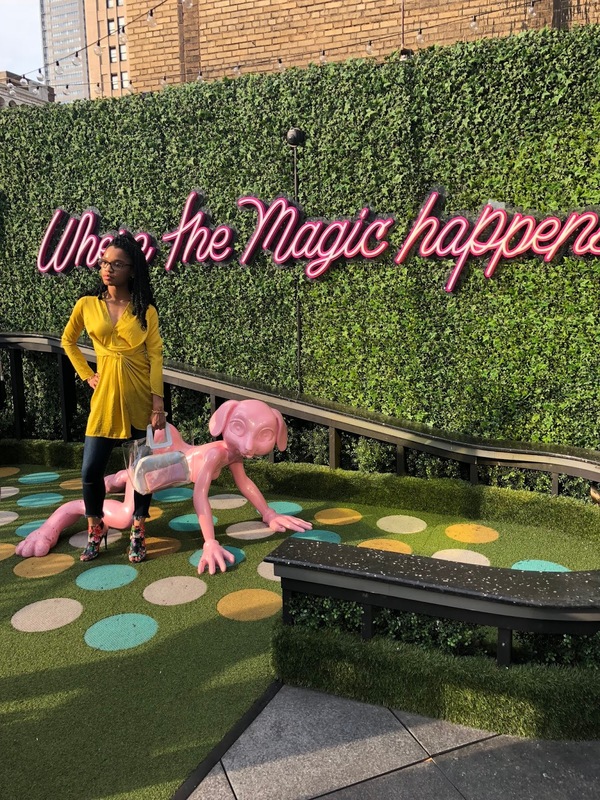 There were a few inspiring posts that caught my eye on Pinterest and I decided to wear my favorite pair of Just Black Jeans under the dress with a statement shoe. My shoe of choice were my Steve Madden floral heels I got for Christmas a few years ago. I never wear them anywhere they can get damaged so they are in an amazing condition. 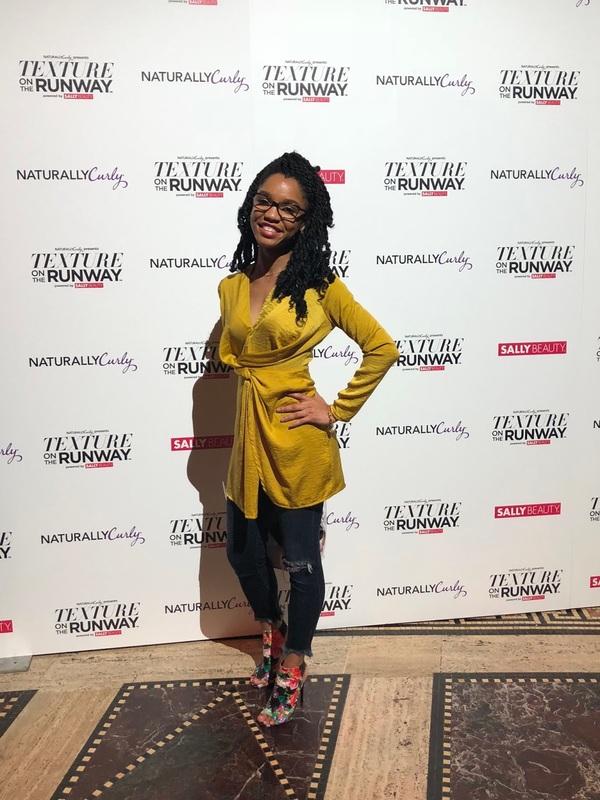 I wore this look to the NaturallyCurly Texture on the Runway show and there’s no clear “dress code.” I decided to mix my dressy and casual so I could fit in on both sides of the fashion fence. It worked out nicely, I ended up getting a lot of compliments on my look and I was comfortable the whole night. Success! 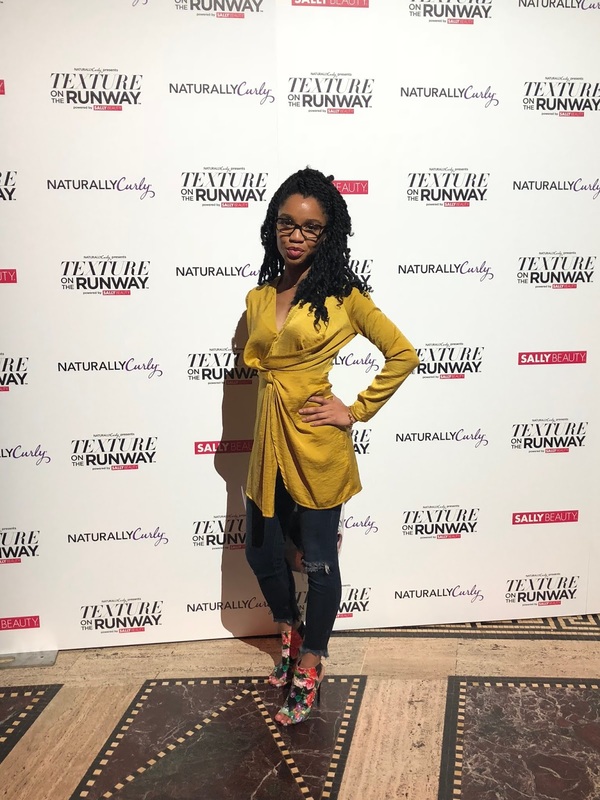 After our visit to MOXY we followed up with a hair show from Naturally Curly, Texture on the Runway. This was their 20th anniversary and I thought it was amazing. If you haven’t been you should definitely attend. Without giving too much away, there’s always interactive activities you can do prior to the show starting. It’s a great way to network and bond with other girlies about all things natural hair. Major brands have tables their with their representatives talking about different products. 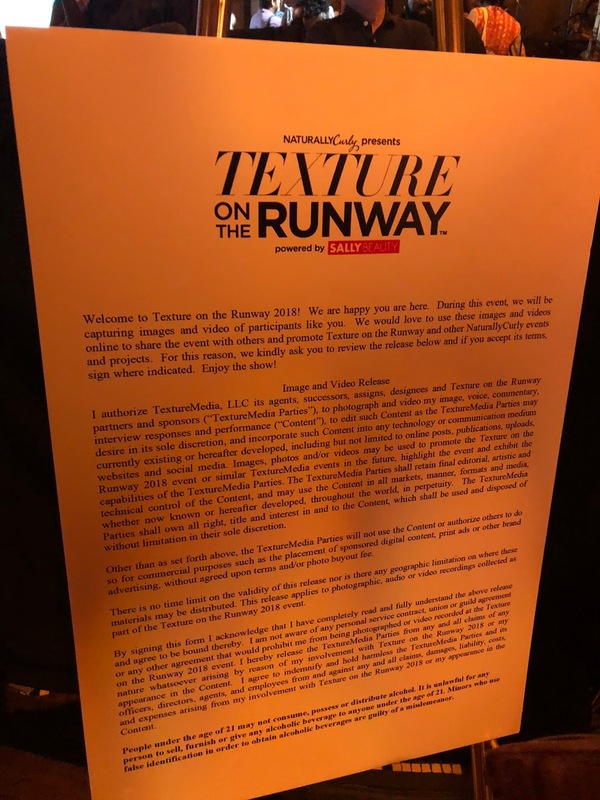 I love attending the Texture on The Runway show because I’m always exposed to a new product that I never thought about trying. Oh, and the swag bag isn’t bad either. It’s actually amazing and the best swag bag I’ve gotten to date. Stay tuned for the unboxing!